Though it is October and feeling like Fall already, it felt more like summer here this past weekend. It was warm, sunny and the weather was beautiful! I am glad we had such a gorgeous weather over the past few days while my sister and niece were visiting. We enjoyed spending time together and I loved playing with my 2-year old niece. It’s amazing how fast children grow! It feels like yesterday when she was born. We also went shopping this weekend and I found a beautiful Le Creuset baking dish that I can’t wait to use and bake something delicious for the blog. This week though, it looks like we will get lots of rain. Even though it seems like summer went by so fast, I am pretty excited about Fall too. Cozy clothes, warm boots, scarfs and crisp air. I am loving all the Fall colors right now – the trees are painted in all shades of green, yellow, orange, red and brown. The drive home yesterday was so beautiful and picturesque – I felt like I am in a postcard. It’s made only for 30 minutes, from start to finish. And it’s also loaded with lots of nutritious ingredients – green beans, onions, garlic, celery, carrots, zucchini, potatoes, green peas. All the vegetables are cooked and eventually pureed to create this creamy bowl of deliciousness. Enjoy! Hope you give this recipe a try! I am sure you will love it and it will become one of your favorite go-to recipes for soups. Place green beans in a pot and fill with water. Bring to a boil over high heat and boil until green beans are tender. Drain and place aside. While the green beans are cooking, heat oil in a large pot and add onions. Saute until translucent. Add garlic and saute for 30 seconds. Add chopped celery, carrots and pour 1/4 cup water. Cook for about 4-5 minutes until vegetables are tender. Add potatoes and pour 1/2 cup water (you can use the water from green beans). Season with salt and pepper, stir and cover with a lid. Cook until potatoes are tender. Add green beans, zucchini & peas to the pot and the remaining water to the pot. Add milk and bring to a boil. You can add more water if you want the soup to be more liquid. Cook for about 10 minutes until vegetables are cooked. Add chopped dill to the soup and puree using a handheld Smart Stick. Now you can add shredded cheese to the soup and stir well until it’s melted. Serve warm and garnish with shredded carrots, dill or sour cream. 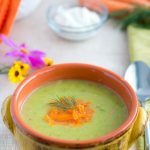 This Creamy Zucchini Soup is healthy, delicious, hearty and comforting. Ready in only 30 minutes. Add green beans, zucchini & peas to the pot and the remaining water to the pot. Add milk and bring to a boil. You can add more water if you want the soup to be more liquid. Cook for about 10 minutes until vegetables are cooked. Add chopped dill to the soup and puree using a handheld Smart Stick. Now you can add shredded cheese to the soup and stir well until it's melted. Mmm, veggie packed goodness – I love the sound of this! I’ll totally be trying this but without the celery! I can’t stand the stuff lol! It sounds so refreshing though. I don’t usually like zucchini but it sounds like this creamy soup packs a ton of flavor! Thanks for the recipe! Wow, this looks so pretty and inviting! And I love how healthful it is! So many veggies, and I am sure that once blended together you would never know it. I say that because trying to get some people to eat veggies is a challenge, and “hiding” them in here is a perfect way to get them in our diet. Officially adding this to my “must make” list! I’ve never used zucchini in soup like this! It sounds delicious. 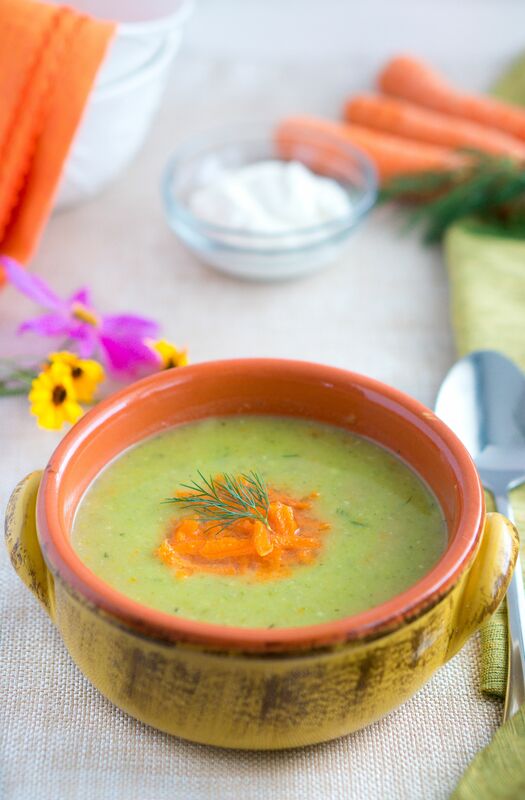 only 30 minutes to make for this delicious zucchini soup? IM IN!